Good news for the Apple fans. After much wait, Apple has finally unleashed the large screen display which is now available on Apple’s online store. The 27 inch Cinema Display is surely a gigantic screen designed for all type of users looking for focussed display. Watching movies, playing video games, or for graphic designers who are looking for the perfect delivery of images, is a must grab. 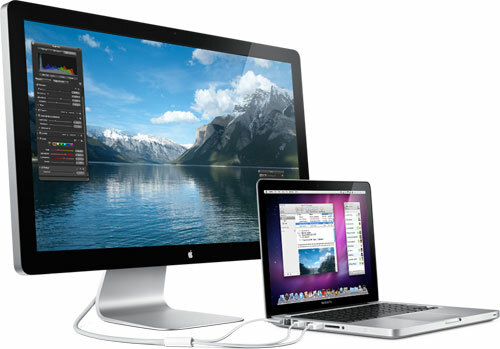 The LED Cinema Display has the ability to connect with your Mac Notebooks and Desktop computer. The MacBook, MacBook Pro, MacBook Air, iMac, Mac Mini and Mac Pro, can easily be connected with the LED Cinema Display through the ultra-compact Mini Display Port Connector. Apple also guarantee’s that its new 27” LED Cinema Display is the ‘Greenest Apple Display Ever’. The Apple Display is designed with great features to reduce its environmental impact. Build with: Arsenic-free display grass, Mercury-free, BFR-free, PVC-free, and Highly Recyclable Aluminum. The new display monitor carries a price tag of $999 and would ship after 1-2 weeks after order placed with Apple.